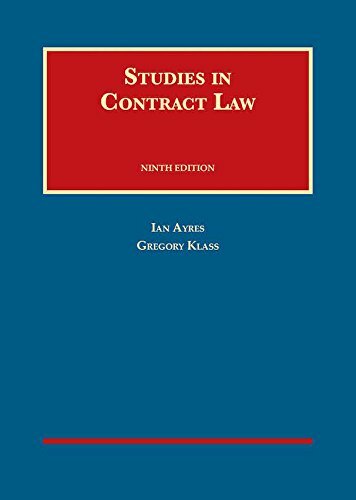 1634603257 -In the Ninth Edition of Studies in Contract Law, Ian Ayres and Greg Klass have continued their work of streamlining, updating and supplementing this classic casebook. The new edition includes extensive discussion of the Draft Restatement (Third) of Consumer Contracts. There are new cases on telemarketing, good faith, the perfect tender rule, warranties and reliance, half-truths, fraud liability between contracting parties, class arbitration, adequate assurances, mitigation, mental anguish, intentional interference, and personal services contracts. And the authors have added three new drafting exercises to the many practice problems that the book has always included. This edition makes some structural changes to the chapter on remedies to make it more accessible to students. The discussion now begins with general principles, such as the choice between damages and specific performance, efficient breach, and the foreseeability, mitigation and certainty rules. It then addresses seller and buyer remedies, under the UCC and common law, followed by a discussion of special topics such as personal service contracts, liquidated damages, and recovery for nonpecuniary damages. The new edition also includes a new section on fraud liability between contract parties―a topic that usually falls in the gap between Torts and Contracts. And the authors have integrated materials from the arbitration chapter into the rest of the book, and added new section on the Supreme Court’s recent class arbitration jurisprudence. Ayres has now recorded more than 90 contract law videos that will be freely available for viewing on Coursera.com and YouTube (search for “Ian Ayres Contracts”). These videos are largely free-standing discussions of individual cases from the casebook and can be used as supplemental lectures or to “flip the classroom.” Ayres has also recorded more than 30 videos, also freely available on these platform (search for “Ayres Law Students toolkits”), covering basic legal concepts (e.g., rules vs. standards) and techniques (e.g., how to brief a case) that might be useful for first-year students.